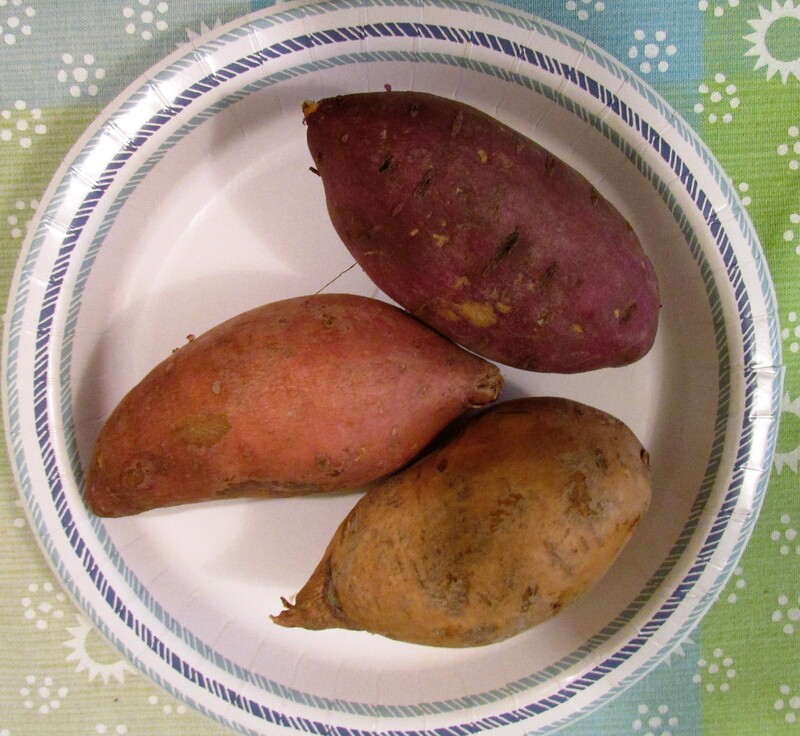 I bought three different varieties of sweet potatoes in the market this week, a red, a white, and an orange yam. I’m not planning a new recipe or dish, instead I’m going to grow them, and hopefully, when they sprout, they will all have foliage in different colors. The foliage of sweet potatoes is lush. After they sprout, I’m hoping to grow them on in hanging baskets with flowers added for color. Sweet potato vines are available for purchase in garden centers. They are expensive, usually 3.99 a pot. For less than a quarter of what three plants would cost, I should have three plants for my baskets. I’m starting them in water. Until they sprout, I’m keeping them in the basement to mimic the darkness underground. Hopefully, updates will follow with photographs of wildly growing vines. Great post and tips. Keep us updated. When I buy sweet potatoes, it is usually on a whim. I want to turn healthy or be good or something like that. Very soon the whim goes away and the sweet potatoes remain on my rack along with my onions, shallots, garlic and ginger. 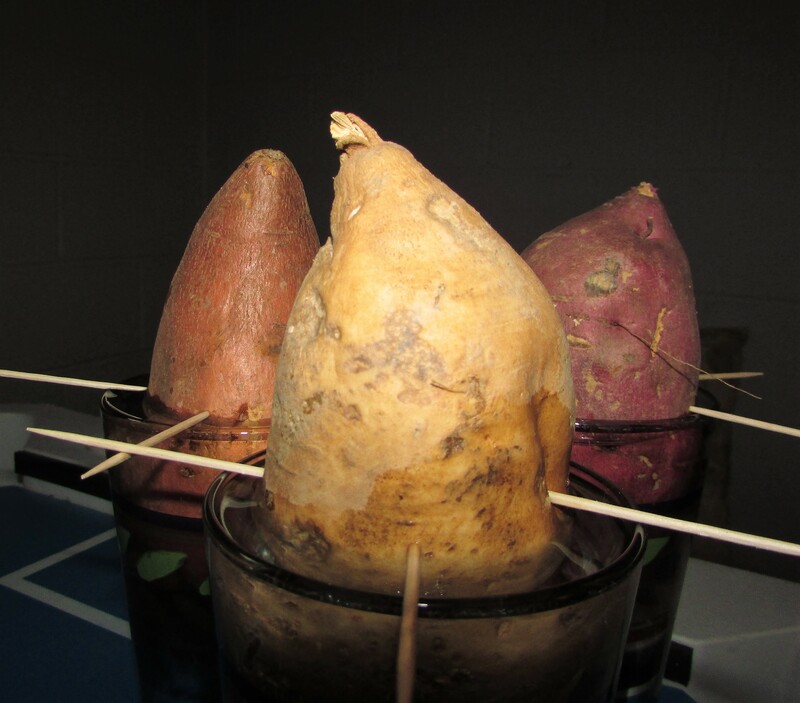 Soon the cold and humid atmosphere of my rack which is not much moved and is a in dark corner, makes the sweet potato bud – no need for water or anything. This way I got about 6 sweet potatoes with long vines in my rack. I didn’t know what to do with them. My daughter ( the one with the exams) got into a do good fit and planted them out in the garden, where they are doing well in the now spring weather. Have you grown potatoes too ? Have you been successful ? Would you share pics of the potato plot ( your sister’s) in another post ? Ah…found them…they are potatoes. They look delicious. Yes, after a dreary start the sun is brilliant. Waiting to see the vines. I hope they grow by planting time. I’m going to do this too. Every year I resist buying the plants due to the cost. They are way too expensive. I’ve tried to grow almost everything this year from seed or tuber. I love the orange variety. They re so sweet. I have some in my garden. Plated some cutting a few months ago. We use the young leaves for our “sinigang” a sour dish typically unique in our country. Hi Arlene, I didn’t know you could use the leaves for dishes. I will have to look up the name of the recipe and see what it is. Thanks. I bought two potato vines last year and enjoyed the foliage. What a brilliant idea to grow them from real potatoes! 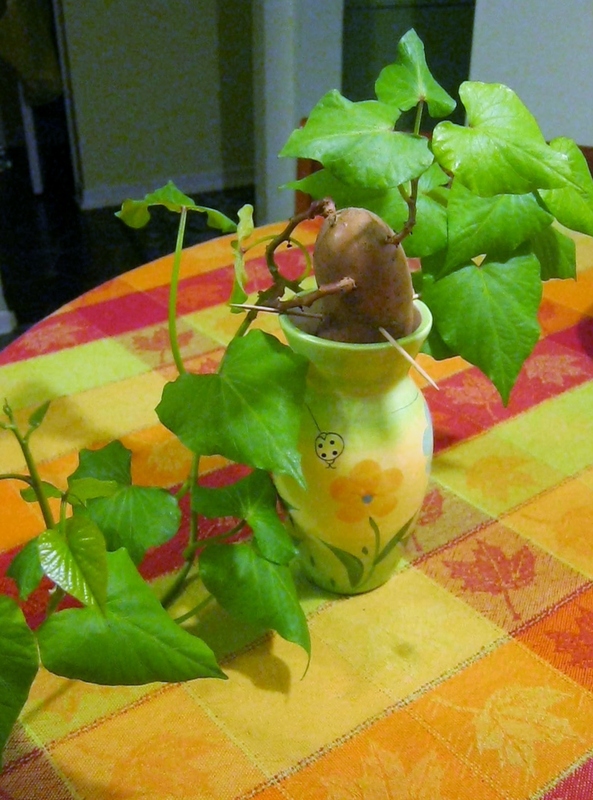 Anne, I’m hoping for some different colors too…I love the chartreuse green shade of sweet potato vines, and know the yams will grow a darker green…I’m hoping the white or red potato might be chartreuse. Please post photos if you get something special. I enjoy a garden through your eyes. Please keep us updated on your vines! This looks so interesting. I grow regular potatoes but not sweet potatoes. I will do that…now I am thinking of all the many tubers I see sold in the produce bins…and wondering what amazing plants they might grow into. That is so true! I have read that people do that.